It was a fitting end. 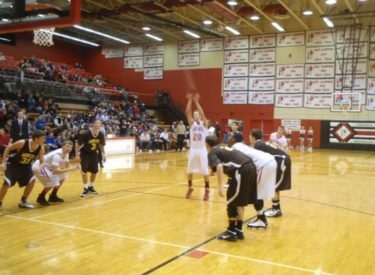 Garden City’s Cody Bernbeck made a 40 foot three pointer at the buzzer in Liberal’s 49-48 win over Garden City Tuesday night at the Big House. Bernbeck scored 22 and son of former LHS basketball player Sam Curran, Jake Curran scored 13 and heated up in the fourth quarter. Fortunately for the Redskins, Bryan Morris was 4-4 at the free throw line during the closing minute of the game. Liberal led by as many as 11 (35-24) in the third quarter and led 35-26 at the end of three. It was 17-17 at halftime. The last three meetings have resulted in an overtime 57-55 win for Garden in Garden City last season, and two one point wins for Liberal at home against the rival Buffs. Liberal is 5-3 overall and 1-1 in the WAC. Garden falls to 1-7 overall and 0-3 in the WAC. Liberal faces Scott City in Scott Friday night.